Money matters? Perspectives on Monetary Policy: Macro-prudential: if not now when? At the turn of 2000, when the € was at 0.85, very weak, against the dollar, the then Economic Counselor of the International Monetary Fund, Michael Mussa, issued a statement that made some waves in the monetary world: "if not now when?" . With that statement he made the point that if there was a time when a central bank had to resort to the unusual step of intervening in the foreign exchange market, that time had arrived for the European Central Bank. As is well known, the European Central Bank, with the support of the FED, the Bank of Japan and the Bank of England, did indeed intervene, the through of the € exchange rate was surpassed and is now long forgotten, with the € some 60% stronger than it was then. This was the first time the young central bank carried out interventions in the market and it did not only contribute to a more sensible valuation of the € on the market but also made some hefty capital gains. Other, even larger, capital gains were made by the ECB in its subsequent interventions, this time on the capital market, purchasing covered bonds and peripheral sovereign bonds . This is an interesting, and insufficiently considered, point, but it is not the one I want to make in this post. My own "If not now when?" refers to the opportunity to have recourse to macro-prudential measures in the €-area. There is probably more controversy about the idea of having recourse now to macro-prudential measures in the €-area than there was on intervening in the foreign exchange market when Mussa issued his "If not now when? ", but I will try and show that the case for having recourse to macro-prudential measures is a solid one. Let me start, however, recognising that macro-prudential policy is in its infancy. The problem starts with the listing of the macro-prudential tools: clearly changes in Loan to Value (LTV) ratios belong to the list together with dynamic capital charges for banks. One should probably add increased haircuts for repo operations or more generally for operations which can generate leverage (including derivative operations), but as one gets down the list, the risk of rehabilitating disgraced direct control measures under the nobler mantle of macro prudential measures increases. 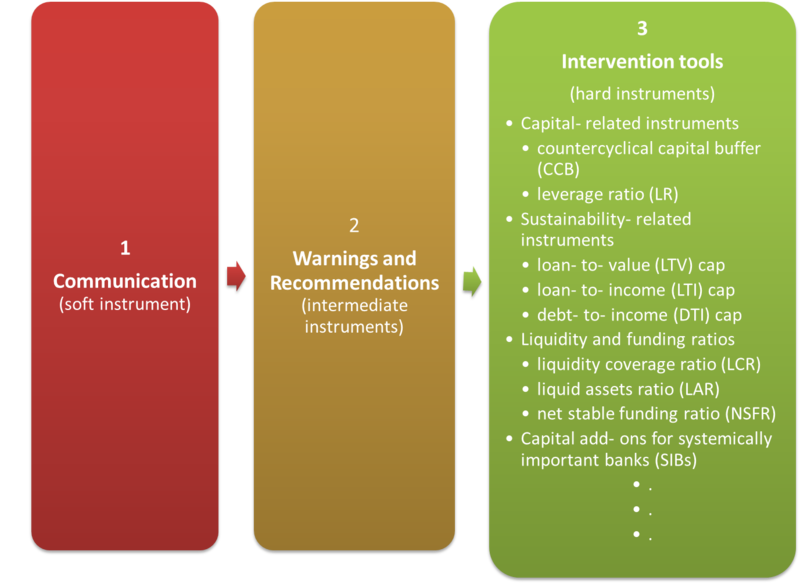 The chart below reports the best taxonomy of the macro prudential toolkit that I could find, elaborated by the Bundesbank. If the list of macro-prudential tools is uncertain, there is even more uncertainty about their efficiency and therefore their calibration: while tons of studies help central banks calibrate their interest rate policies to achieve their target, normally price stability, there is a dearth of studies helping to size macro-prudential tools to preserve or achieve financial stability. But these difficulties are somewhat analogous to those affecting central bank interventions, both on the foreign exchange and the capital markets: their effectiveness depends so much on specific circumstances that there is no way to predict accurately whether they would indeed work or not. There are a number of circumstances that can help determine whether they would be useful or not, but there remains a lot of uncertainty. The uncertainty about the definition, calibration and effects of macro prudential measures feeds an unsettled controversy among economists. If the central bank has only one tool, interest rates, and two objectives, price and financial stability, dilemma situations may arise in which one objective would require an increase (or a decrease) of interest rates while the other objective would require the opposite. Those who have more trust in the usefulness of macro-prudential measures stress that they can solve the monetary policy dilemma, as they allow respecting the famous Tinbergen rule that there should be at least as many tools as there are objectives. Those who are more sceptical about the effectiveness of macro-prudential tools stress that interest rates reach all parts of the economy while macro-prudential measures risk affecting only the banking sector or, at most, the formal component of the financial sector, giving incentives for the development of the "shadow banking system". I am not sure I understand what he had concretely in mind, given that his comments seemed to be more general and conceptual than tied to anything specific and current. Still I can not help connecting what he said to some important declarations, in particular from the President of the Bundesbank, Jens Weidmann. In more than one occasion he said that there are financial stability risks from keeping interest rates very low for very long. For instance he recently said: "(…).Please consider also that low interest rates are intended to give a boost to consumption and investment. That is the very reason why the central bank keeps them at a low level. (…) However, we must not turn a blind eye to the fact that extremely low interest rates also harbour risks to financial stability and the efficiency of economic structures. ...There is a danger of economic agents such as households and, in particular, enterprises, but policymakers, too, getting used to the ultra loose monetary policy. Eventually, this might mean that a necessary structural change fails to take place or that enterprises without a sustainable business model are kept alive. ... At the same time, there is a risk that low interest rates will prompt investors to embark on a "search for yield". An increasing risk propensity on the part of investors might lead to hazardous excesses in individual financial market segments and, as it were, sow the seeds of the next financial crisis." . Both the Bundesbank and the German Finance Minister, Schauble, have clearly denied that there is a real estate bubble in Germany, but the raising house prices in German cities must play some role in the concern of the Bundesbank about financial stability. If one puts together the statement of Draghi about the macro prudential challenge and those of Weidmann about the need to keep interest rates low for macroeconomic purposes, while not being oblivious to financial stability risk, the conclusion "if not now when, for macro-prudential measures" comes naturally. While one should be fully aware that one is experimenting and breaking new ground and that there is a lot of uncertainty, if one forfeits this occasion to start using the new macro-prudential tools when would one want to use them? So, the bottom line of this post is that we may, before too long, see the ECB and national macro prudential agents in Germany and in other countries where there are more pressing financial stability concerns actively engaging in trying in earnest the macro prudential route. "I think the circumstances in which the major countries would want to use intervention to attempt to influence exchange rates are relatively rare, but they do arise from time to time and one would sort of have to ask if not now, when?" Michael Mussa, Economic Counsellor and Director, Research Deptartment, IMF, WEO Press Conference,September 2000.